Behaviour of a section of England fans in Germany was "inappropriate, disrespectful and disappointing", says FA chairman Greg Clarke. England lost 1-0 to Germany in Dortmund on Wednesday night, but a section of England supporters booed the German national anthem and sang chants referencing World War Two. It is understood that the FA is trying to gather footage of the behaviour. If found to be involved, supporters could be banned from attending games. "The FA has consistently urged supporters to show respect and not to chant songs that could be regarded as insulting to others," said Clarke. "Individuals who engage in such behaviour do not represent the overwhelming majority of England fans nor the values and identity we should aspire to as a football nation. "We are working with the England Supporters Travel Club and speaking with the Football Supporters' Federation to come together to address this issue. "Everyone involved in the game has a responsibility to ensure that attending a football match is a safe and enjoyable experience for all." The FA part-fund the Football Supporters' Federation (FSF). This includes funding for an annual supporters' summit to discuss fan issues. An FSF spokesperson said: "Over the last 20 years, English football fans have built a worldwide reputation for our passionate support and the vocal backing we give to our teams. 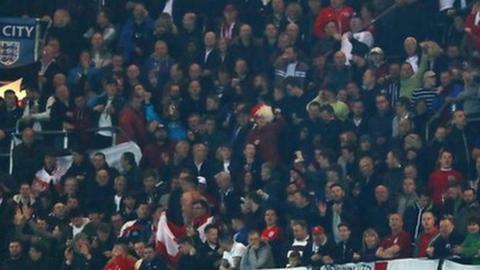 "Unfortunately little of the wit and imagination that goes into our club football songs is reflected at England games. "England's travelling support is made of people of all ages from a range of clubs, many of whom have worked hard in recent years to improve our standing abroad and have expressed concern to us about these chants. "We don't want to regress to a situation where that reputation is tarnished by the actions of a minority."